The dimensions tab on the campaigns page gives you customized details about certain aspects (or dimensions) of your campaigns in easy-to-read tables and graphs. For example, you can see search terms or top mover data. Maybe you'd like to compare the conversion rates for your campaigns on Friday with those on Saturday. Or perhaps you're curious about how many clicks you're getting in one city versus another. Just a few clicks on the Dimensions tab will answer those questions, and more. The Dimensions tab gives you customized details about certain aspects (or dimensions) of your campaigns. The tables and graphs for the dimensions are based on the full reports you find on the Reports page, but quickly available right on the Campaigns page. That date information you wanted? Select the Time and get key performance indicators (KPIs) by day of the week - or other date ranges. Interested in target locations? Select the Geographical location dimension and get KPIs broken down by state/province and country/region. Time This table displays performance data based on the date option you select (Date, Day of week, Hour of day, Week, Month, Year, Quarter). The graph has the same performance trend format that's used with the Campaigns, Ad groups, and Ads tabs. Search terms This table displays what people are searching for when your ads are shown. Use this to find new keywords to add, or negative keywords to remove from your campaigns. Shopping This table displays performance data for shopping campaigns by all available dimensions and product attributes, such as category, brand, store and item ID. Item ID is the most granular level possible. Shopping campaigns are not available for everyone yet. If you don't see this option, don't worry! It's coming soon! Geographical location This table displays performance data by targeted locations. Publisher website This table lists performance data for both search results pages and Windows apps where your ads appear. Call forwarding detail This table lists details for each of the calls made to your call forwarding number. Top movers This report identifies the campaigns and ad groups responsible for the biggest changes (both increases and decreases) in clicks and spend during a specified time period, and suggests possible causes and actions for each change. User location This table displays performance data, organized by country, state, metro area, city, county, postal code, and radius for each campaign and ad group. Landing page This table displays performance data organized by landing page for each campaign and ad group. Age and gender This table displays the estimated performance data, organized by gender and age group for each campaign and ad group. 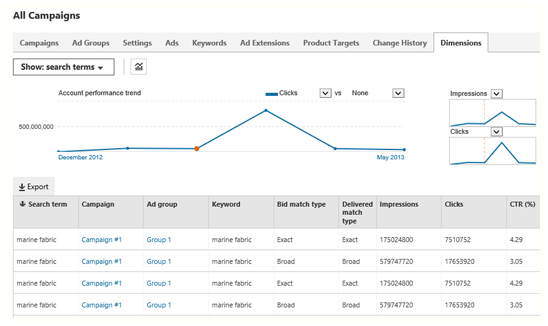 Labels This table displays performance data based on the label you select (keyword, ad, ad group, campaign). The tables display KPI information for each dimension you've select. For example, the table for Destination URL lists the destination URLs used in your ads along with performance measurements such as impressions, clicks, click-through rate, average cost per click, and number of conversions. The time range you select has an impact on the performance data shown in the table. For example, selecting Last month for this account doesn't display anything in the table. But designating a longer period of time with Custom range provides enough information to display. Each dimension on the tab has a corresponding report on the Reports page. If you're working with campaigns that have a very large amount of performance data, consider running the full reports. Use the dimensions tab graphs to compare conversion rates for your campaigns by date, to see how many clicks you’re getting in one city versus another, or to see KPIs broken down by state/province and country/region. Click the Dimensions tab, then click one of the available dimensions listed above; if the graph is closed, click the Show graph toggle to open it. It remains open until you close it. The dimensions tab has seven dimensions to select from (listed below). Click on a dimension under the tab to display the summary table and performance graph.